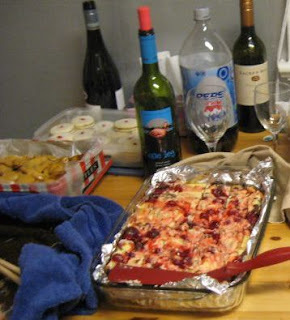 I'm still recovering from Saturday's 14th Annual Girls Only Potluck, aka "GOP", aka The Big "OMG-I-Gained-5-Pounds-In-One-Night" Binge of 2009, or as the boys like to call it, The Night Our Hot Wives Get Together & Have a Pillow Fight. Every year, we invade Monique's home, taking over her kitchen, stove, fridge, and deck (to chill the booze of course). We eat. We talk. We eat some more. 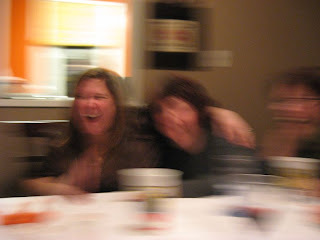 I watch my friends get drunk (and laugh hysterically at them). Eat again. Oh, and we take a group picture. Here's us trying to arrange ourselves for the shot. It's not easy. There's a lot of us. And after eating all that food, I'm truly impressed that we all fit within the frame. 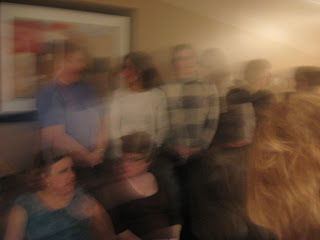 No, I blurred on purpose to protect identities -- I think some of them are on some witness protection program or something, and the rest are on the lam from the law. Don't let their cuteness fool you. The little preggers in blue is particularly suspicious. Anyway, where was I?... invade, eat, talk, eat, drink, eat, picture... oh, yeah, and laugh. We do a LOT of laughing. See? Here's our hottie-hot-hot-hot hostess laughing. Yes, she's blurry too. I can't tell you her secret -- she might not invite me again next year if I do, and I'm not *that* foolish. The grub is truly blackmail-worthy. As usual, I ate too frickin' much. The food was delicious! And it all started with the tuna sashimi appetizer. It's no secret that raw fish is never safe when Harmzie and I are in the vicinity -- we polished off the sashimi when no one was looking.... hehehe. We're such sneaky sneakersons. And of course, the FoodFest just took off from there. 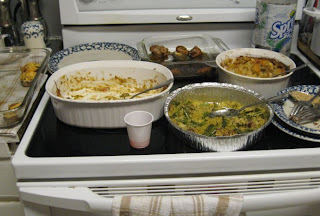 The broccoli bake, the couscous, the salads, the stuffed mushrooms, the meatballs! AHHHHHHH!!! 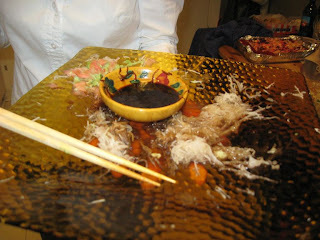 Here's a picture of the food after dinner. No, I didn't take one before. Are you kidding me? I was too busy eating. But the author of my healthy-eating downfall was truly the almond/cashew/macadamia nut brittle. It's there in the picture to the very left. I barely managed to tear myself away. But I did, thank heavens. Lucky too, because none of my friends would've been any help -- they were all too drunk. Thanks to Monique for another successful pillow fight -- I mean, GOP. Can't wait for #15! Great logo on the shirt! 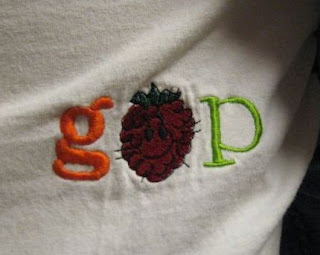 I especially like the hairy poop in the middle between the g and the p.
But what does a hairy poop have to do with the GOP? You eat so much that your poops are hairy the next day? That doesn't sound so great to me. The food looks good --- was there any banana sauce chicken? She's lying. The photo is blurry because it was a pillow fight. That's how they go. @albert -- The "Boys" do several things through-out the year (off the top of my head: back-yard fires, go-karting, cabin "projects", or the perennial favourite: Sandwich Nite). They claim each time that they're entitled because they *never-ever* get to do it. Mostly because yes, it is FAR less organized. It might even be the reason LRM & her husband finally separated... their email addresses (hey! I got to use that line too!) It was just too painful to watch them pull boyz nites out of their collective butts. p.s. to Nen: I'm surprised you didn't link to the spice-rack post. Although, I suppose to be fair, it really was about a spice-rack. Wow, that sounds like a lot of fun! And the food... oh the food. My tummy started grumbling as I was reading this post late last night. Had to shut it down and come back to the post today.